Insure My Van is the van insurance wing of the CFM Group – one of Ireland’s largest insurance brokers. It was the country’s original specialist van insurance provider, and remains the largest, with more than 40% of the van insurance market. An existing website handled a large volume of their business, but had become quite stale looking. 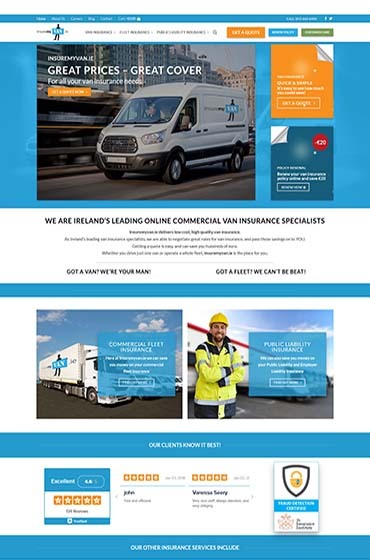 They were impressed with our recent design of their travel insurance website, Insure My Holiday – so they asked us to work our magic on the van insurance site too. We first performed an intensive audit of the existing site. We advised the clients on how some content could be improved and better presented, and agreed an action plan on this. The clients also gave us a detailed brief of their vision for the new site. It was to be somewhat similar in style to Insure My Holiday, but still with its own distinct look. Furthermore, we devised an SEO action plan for the new site, to maintain and improve upon existing rankings. Insure My Van already ranked highly on page one for several key search terms. It was of utmost importance that our new-look site should stay there. Finally, we engaged our partner firm, MDC Information Systems, to build a bespoke back-end office system for the site, to meet all client needs. We started work on the website design itself, while they started work on that. The primary function of this website was to convince users that Insure My Van delivers great value, and to persuade them to get a quote. Our senior designer achieved this through expert placement of home page text, sliders, and other graphics. He also included a prominent ‘Get A Quote’ button, and highlighted other offers such as further discounts for online renewals. Internal pages were equally attractively and strategically laid out. We gave extra consideration to the site’s blog. This was because this would form a key component of our content marketing strategy going forward. Our designer also fully integrated the site with the back-end office system built by MDC. Rigorous User Acceptance Testing (UAT) followed this step. We provided a full project management service as we liaised between the client and the back-end developers. Finally, we carried out intensive SEO work on the new site before going live. This achieved our aim of at least holding all existing rankings, and improving some of them. We are providing further SEO services as part of an ongoing digital marketing package. Contact Us for a consultation on what exactly we can do for you in Website Design, SEO Services, and Digital Marketing campaigns.